One day, I was talking watches with a fellow watch nerd, lamenting the pacuity of innovative design at the affordable end of the market. It is not that there are not some great looking watches in the under $500 range, but that there are so many that are clearly derivative. How many Submariner-style divers, fliegers, or field watches does the world need? Why aren't there more small, budget friendly brands taking chances? I understand that many play it safe because they want to sell watches, and I can't fault them for that. Watch makers need to eat too, and if cranking out some nice, safe, easily marketable watches makes that happen, then more power to them – particularly if the result is well executed. Still, when I see a watch designer try something different and it get it right, it grabs my attention in a way that an homage cannot. 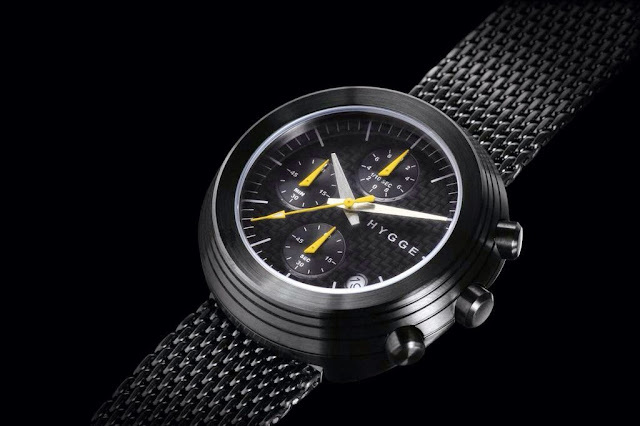 Hygge Watches is one of those brands that is bending the rules in a well executed and highly satisfying way. It was established in 2009 by a Japanese dial manufacturer with a close connection to Scandinavia. Their mission is the merger of Scandinavian design and Japanese quality. According to their site, "Hygge" (hyoo-gah) is a Danish concept expressing "a fundamental aspect of a lifestyle where cozy, warm and friendly feelings are cherished." Considering that my knowledge of Danish begins and ends with the eponymous breakfast pastry, I knew nothing of this, so I decided to dig a little deeper. I quickly discovered that hygge is one of those cultural values that is at once essential and impossible to define. From what I can gather, the feeling you get on Christmas morning drinking a cup of coffee while watching your kids play is a moment of hygge. Running into an old friend you haven't seen in years, popping into a bar for a beer, and then talking and laughing for hours is also hygge. It is a great word for an elusive feeling. Given their soulful ethos, you might expect Hygge watches to be familiar, traditional designs in warm colors, but this is not the case. Instead, the designers have taken a modernist approach, executed in black and silver with accents of bold primary colors. The results are clean, sleek, and more than a little playful. The company clearly values creativity, and indeed they have given their two designers, Mats Lonngrën and Major W.M. Tse, star billing on their home page and credit for the watches they have created. Lonngrën's piece, the 3012 series, uses a two-hand Miyota 2026 quartz movement, and swaps the hands for discs that dominate the dial. The arrangement creates three distinct layers on the face, and the hour disc provides a pop of contrasting color sandwiched between the matching dial and minute disc. Interestingly, the positions of the discs (hour below and minute above) ends up reversing the traditional "big hand, little hand" layout, but does not sacrifice readability. The stainless steel case is round and lugless, measuring 39mm across and just 9.3mm thick. The crown is recessed flush with the case. A notch on the underside provides access. It is available in a sandblasted finish with a white dial, or matte black IP with a black dial. 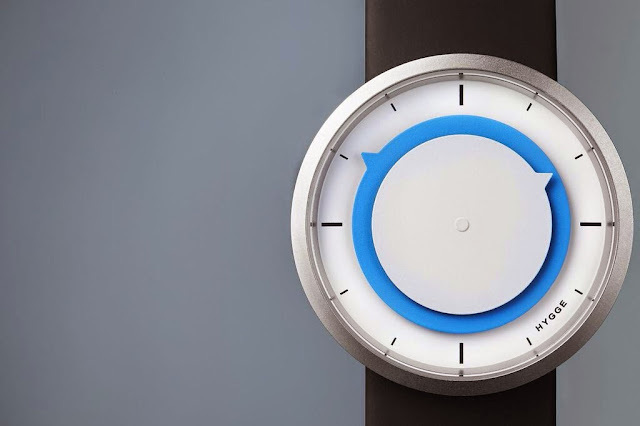 The watch has won multiple design awards and sells for about $210. Major W.M. Tse is responsible for the rest of the Hygge line. His square 2089 series pays homage to the angular facade of the Danish Royal Library in Copenhagen. The three colorful hands of the Miyota 2035 quartz peep through a window in the dial. The lugless case is 32mm and matte finished. Dials are black, white, or silver. Strap options include polyurethane, leather, or a stainless steel bracelet. Prices start at $126.50. Tse's other creations are chronographs. The Seiko VD55B powered 2204 series sports a round, 41mm case in black IP or brushed stainless, with conventional 22mm lugs. The case sides are knurled and the layered dial is perforated on the left side, lending a highly textured, industrial look. The baton minute and hour hands are either black or silver, coordinating with the dial, and accented with contrasting stripes that bisect their length and align with the hour markers. In what seems to be a Hyggee hallmark, the remaining four hands are brightly colored. 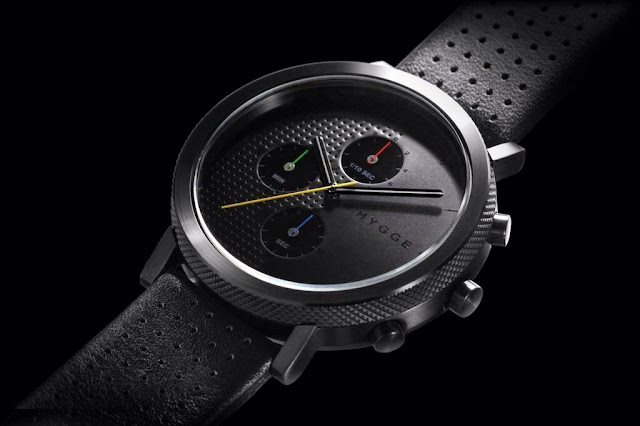 Sub dials for minutes, seconds, and tenths are located at the top, bottom, and the perforated left side of the dial, while the Hygge brand occupies the right. It is nicely balanced and particularly striking in black, as the perforations, markers, and text go into full stealth mode, displaying the colored hands to their greatest effect. Water resistance is 100m, unlike the three hand models, which make do with a splash resistant 30m rating. Strap options include perforated black leather and a black stainless "beads of rice" mesh bracelet. The 2204 can be found online for about $209. The final watch in the line is the 2312. It carries a Seiko VD57 six hand chronograph with date complication in a cleverly stepped, lugless, 41mm case. It is much thicker than the other models, a comparatively beefy 13mm, but this girth creates a pronounced conical shape with a broad, flat bezel and a deep set dial. Like the other models, it is offered in black and silver. Not quite losangé shaped minute and hour hands contrast with the dial. The arrow shaped sweephand is bright yellow on all variants. Asymmetrical sub dial hands are black on the silver dial, yellow on the black dial. As with the 2204, the black on black combination is my favorite because of the way it displays the yellow hands. The dial is layered and textured, this time with what appears to be a woven pattern. Leather or mesh bracelets finish them off. My one complaint? The white 4:30 date complication. It looks fine on the silver dial, but the black dial would have been much improved with a white on black disc. Yes, I know it is a major hassle to do custom dials on off-the-shelf movements, but it would have made such a difference. Still, of all the watches in the collection, the black on black 2312 is the one for me. It is distinctive, legible, and recalls 1970's vintage racing chronographs without mimicking a single one. A 100m water resistance rating and price tag around $200 pretty much seals the deal. I want it. 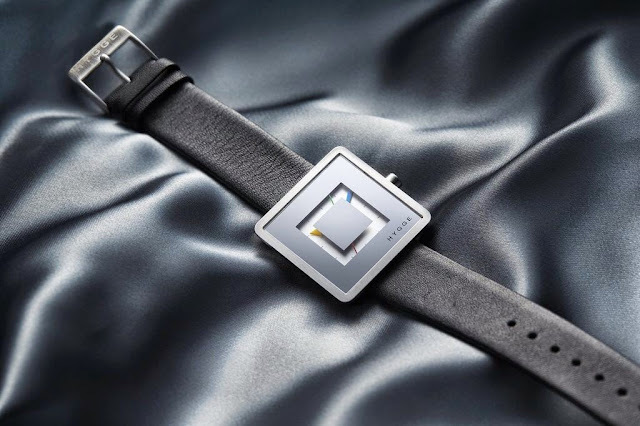 Hygge watches are clever and fun. It is refreshing to see such creative details in watches that are so affordable. My Internet searches could not find a single one listed for more than $255, and most were far less. If you are looking for something out of the ordinary, and still easy on the budget, I would suggest you have a look at a Hygge. They are available at WatchCo.com, TwistedTime.com, and Watchismo.com, as well as other online retailers.